Our 35th Annual Dinner Dance & Awards Banquet will be on January 20, 2001. Be sure to get your tickets early because we have limited seating this year. Tickets are only a $ 30.00 donation per person and are available now. Some of the Special Award winners are Ron Drager President of ARCA and owner of the Flat Rock & Toledo Speedways will receive the MARFC Personality of the Year Award. We also, have Sandy Heng reporter from channel 7 news who covers many auto racing events and does pit side reporting. She will receive the MARFC Motorsports Electronic Media Award. Bob Studt will be presented the Lifetime Achievement Award for his over 25 years of racing and his total of 18 ARCA championships. Bob has now formally retired from competition and now is car owner for his son Greg. The club also wishes Stan Yee Sr. a speedy recovery after surgery in November. May you all enjoy a safe and happy Holiday Season. See you in 2001!! Our November meeting was held at Caper’s Restaraunt. 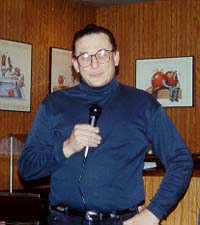 On hand as guest speakers were Ron Allen, Arnold Kirsch and Eddie Sachs. 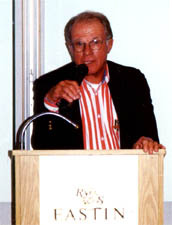 Arnold Kirsch-Took a huge leap from Mt. Clemens street stocks to Flat Rock late models in 2000. Eddie Sachs-Proudly hails his father’s racing achievements and supports racing in any way he can. Beginning his racing career in the 70’s, Ron Allen had never seen the better side of a championship. 2000 proved to be very different. 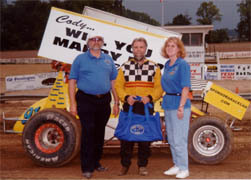 Ron celebrated his 50th career Feature Victory as well as Championships at Toledo and Flat Rock Speedways. Ron recalls the difference in today’s race cars and those he built way back when. Of course he had to tout the fact that the car that took him to his twin Championships was 15 years old!! Noise tests at the Michigan State Fairgrounds has been a big issue lately. One thing you can always count on is support from Arnold Kirsch. 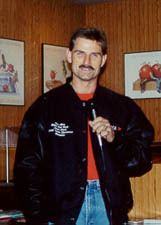 Arnold has participated in all testing at the Fairgrounds and is no stranger to the microphone. Never at a loss for words, Arnolds colorful commentary is always looked forward to. And in the "Wild Man’s" ways, Arnold shared his experiences in racing with us. What else can be said about Eddie, probably the only person able to compete with the "Wild Man’s" commentary. Eddie shares his joy and pride in the recognition his father has received for his racing achievements. Thanks for all you have done for auto racing. The Michigan Auto Racing Fan Club Would also like to recognize NHRA Pro class champion drag racer Jim Adams from Fruitport, MI, representing Milan Dragway who ventured out to the Auto Club NHRA Finals in Pomona, Ca. Jim worked his way through round after round to earn the first place spoils on Nov. 12. Congratulations are also in order for Toledo’s Kirby McClennan. Back in September both Kirby and Jim championed the Super Pro and Pro catagories respectively. The Milan sponsored racers absolutely ruled at the Division 3 NHRA Summit Racing Series held at IRP. Thank you Pat McInerney, Motor City Motorsports Drag Racing Correspondent, for this information. We at the Michigan Auto Racing Fan Club send our thoughts & prayers to the family of Steve Evens who passed away this past week. 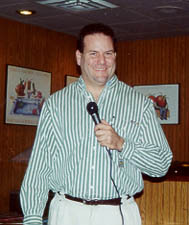 Steve was a great announcer for TNN and broadcast journalist respected by many fellow commentators. He will be missed by many race fans across the country. Bob Capps led the way with information about the relocation of the Michigan Motorsports Hall of Fame and Museum from the Novi Expo center to a location yet to be determined. 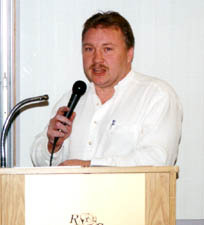 He also ran down a list of nominees for the 2000 induction ceremonies as well as former inductees to the Hall of Fame.Dennis Pulte gave us a rundown of the ARCA team he is crew chief for explaining some of the difficulties multiple team car owners face. 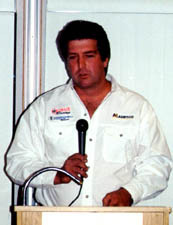 Dennis described the personal sacrifices made by many “weekend warriors” of the ARCA series.Roger rounded out the group of speakers with information of his sponsorship from Dodge and told us not to expect to see the Intrepid anywhere except on the NASCAR Winston Cup Series until the 2002 season is upon us. Now that the racing season is gone by I would like to thank all the membership tracks for their support of our club.We look forward to the 2001 season and hope to add another track to our membership. If you were one of the many members who attended a race at one or more of these tracks it would be great to drop them a line and say thanks for allowing us to be apart of a night of fantastic racing at there facility. Most membership tracks can be e-mailed from our links page. Don’t forget our 35th Annual Awards & Dinner Dance Banquet will be held on January 20, 2001. If you have plans to be in the area at that time be sure to get a ticket early. Just contact me at president@marfc.org. We at the Michigan Auto Racing Fan Club are very saddened by the news of the death of NASCAR CRAFTMAN TRUCK Series driver TONY ROPER. Who died from injuries after a crash at the Texas Motor Speedway on Friday October 13, 2000. September was rather quiet for news and events. It’s hard to believe that another racing season has gone by and new Champions have been crowned. Now all that’s ahead of us is the banquet season. 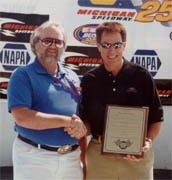 In August the Michigan Auto Racing Fan Club Presented NASCAR Legend Darrell Waltrip with an appreciation award for his 30 years of auto Racing. It was an honor for me to present Darrell with this award in front of 80,000 fans at the Michigan Speedway. Special Thanks to Tommy Cameron for making all the arrangements to give this award to Darrell and to Steve & Cory Russell for helping with the presentation & photos. A Special thanks to Rob Michon for designing the award for Darrell. 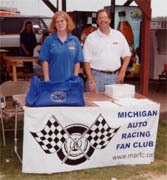 The Michigan Auto Racing Fan Club is very saddened to learn of the passing of Elmer Simko. 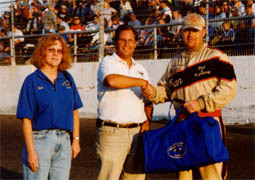 Elmer was Owner/promotor of Owosso Speedway through the 1999 Season and a true race fan. He will be missed by many. Our thoughts and prayers are with the Simko family. Next to our Awards Banquet, quite possibly the highlight of the year 2000 for MARFC was the presentation of a plaque to Darrell Waltrip, commemorating his racing career. As a driver, car owner, television commentator, and outstanding person, you are a unique and outspoken ambassador that has led auto racing into the history books. We recognize you as a veteran and legend to our sport that no other sport has. One who has given his all to do the one thing he loves. May God Bless & Keep you in your next endeavor. Heart filled Thanks and Congratulations from all of your fans here in Michigan. We had some difficulty getting the weather to cooperate with us for Butler’s Fan Club Day, but in the end weather held out long enough for Susan Ginter and Dave DeHem to recruit new members (left), and for President Bill Barnhart and Susan Ginter to award Bob Tohms the MARFC Helmet/Uniform bag just before the rains came.